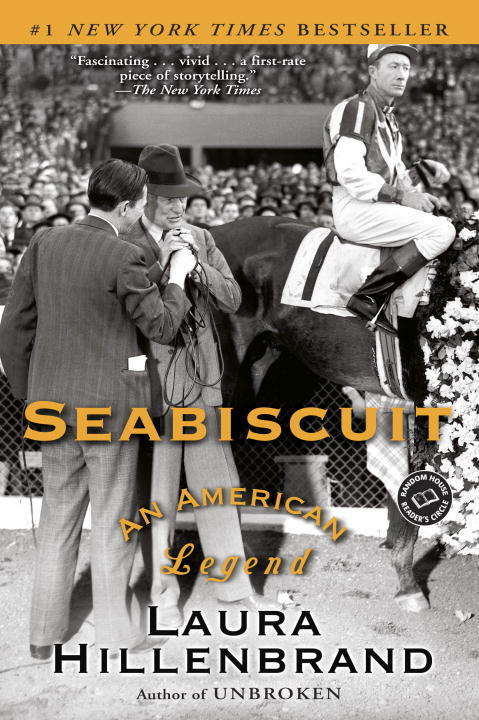 BONUS: This edition contains a Seabiscuit discussion guide and an excerpt from Laura Hillenbrand's Unbroken.Seabiscuit was one of the most electrifying and popular attractions in sports history and the single biggest newsmaker in the world in 1938, receiving more coverage than FDR, Hitler, or Mussolini. But his success was a surprise to the racing establishment, which had written off the crooked-legged racehorse with the sad tail. Three men changed Seabiscuit's fortunes: Charles Howard was a onetime bicycle repairman who introduced the automobile to the western United States and became an overnight millionaire. When he needed a trainer for his new racehorses, he hired Tom Smith, a mysterious mustang breaker from the Colorado plains. Smith urged Howard to buy Seabiscuit for a bargain-basement price, then hired as his jockey Red Pollard, a failed boxer who was blind in one eye, half-crippled, and prone to quoting passages from Ralph Waldo Emerson. Over four years, these unlikely partners survived a phenomenal run of bad fortune, conspiracy, and severe injury to transform Seabiscuit from a neurotic, pathologically indolent also-ran into an American sports icon. Author Laura Hillenbrand brilliantly re-creates a universal underdog story, one that proves life is a horse race.